Webster’s defines “tumbledown” as “dilapidated, ramshackle.” For Tumbledown singer/guitarist Mike Herrera, the term evokes “something from a bygone era that’s been long forgotten,” like the “tumbledown shacks” he read about in the biography Woody Guthrie: A Life. That image of America’s past spoke so loudly to Herrera that it gave his band a name. The music of Tumbledown takes that sepia-tinged image of Americana and sends it hurtling into the present, with the help of some punk-inflected riffs and pure rock & roll attitude. The punky side of the band’s musical personality comes naturally to Herrera, who first became known in the ’90s as the frontman for renowned rockers MxPx, but the pure, honest twang of country music has been echoing in the Tumbledown leader’s ears ever since he was a young boy singing along while Willie Nelson’s “On the Road Again” came stomping out of his family’s car stereo. In the late ’90s, after he’d already spent years on the road himself, rocking out all over the globe with MxPx, Herrera started tapping into that long-held love of American roots music, and out came songs that had more to do with down-home, old-timey sensibilities than the larger-than-life rock world. But it wasn’t until 2007 that he finally formed Tumbledown, to realize his vision of an Americana band with some raw-boned, rock & roll bite. Herrera himself readily admits to being besotted by the romance of recklessness and rough-and-tumble living, the kind you’ll find at the heart of Empty Bottle. In fact, the album’s title track itself was inspired by the intimate relationship the band maintains with alcohol, even when they’re in the studio. “We average about one 750 ml bottle of vodka or whiskey at each session,” admits Herrera, “including regular practice. So, ‘Empty Bottle’ seemed to work as the title on many levels.” The songs were written by Herrera at tour stops all over the world, but the tracks were all laid down at home, in his own Bremerton, WA studio, Monkey Trench. It’s only fitting that the two videos we present to you today are hard-nosed chronicle of all things Tumbledown. On the anthemic “Great Big World” we follow Tumbledown on their regular treks around the United States and get a glimpse about what life is like on a day to day basis. When Herrera sings about Dallas, TX and hoping that its sun still shines, or imploring Seattle to give him a reason to stay, we can see first hand that the man lives it day in and day out and has a connection with every city that he sees along the way. 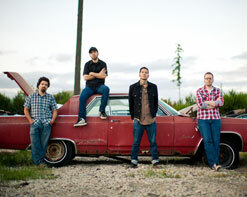 Contrasted with that is the video for “Arrested In El Paso Blues”, which is autobiographical account of the band’s run in with the US Border Patrol. Listening to the song, we can tell the band has been put through the ringer for ending up a little too close to the Mexican border, so it’s only fitting that the video finds the band wreaking havoc inside of a junkyard. Scattered amongst some rusted-out classic cars and true junkyard dogs, the band blazes through a frantic alternative-country number with more than enough energy to go around. We’re very excited to be working closely with Jonathan Gill and the End Sounds crew to bring you these fantastic and energetic clips. We’re well stocked with copies of Empty Bottle for you and your viewers to enjoy, so don’t hesitate to be in touch if you’d like to get your hands on some. If you need more info, please contact Andy Gesner at (732)-613-1779 or email us at HIPVideo@aol.com. You can also visit www.EndSounds.com or www.TumbledownHQ.com for more info about Tumbledown.